Since 2000, FRS Iberia and FRS Maroc have been operating year-round fast ferry sailings across the Straits of Gibraltar between Spain and Morocco. The Main FRS route between Tarifa (Spain) and the buzzing port of Tangier (Morocco) is the shortest seaway between the two continents. 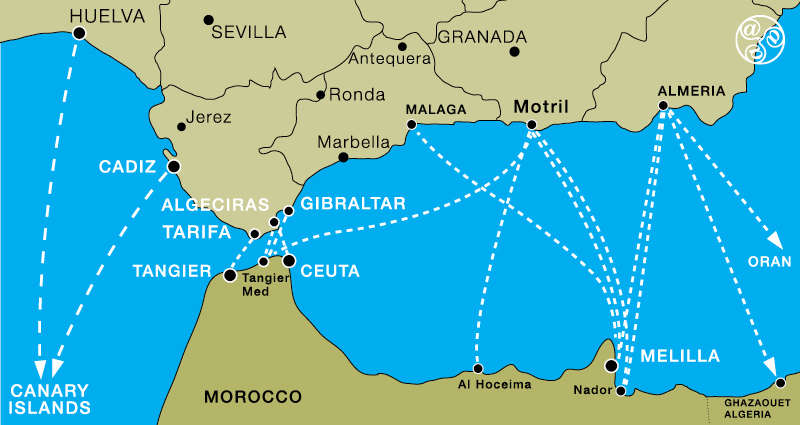 In addition, FRS also connects Algeciras with the ports of Ceuta and Tangier MED. With its modern high-speed ferries, FRS has become the market leader for passenger and car crossings to and from Tangier. FRS ferry crossings can be supplemented with a variety of organised land excursions in and around Tangier. Frequent hourly ferry service by fast Jet Catamaran from Tarifa port to Tangier Town (Morocco). Services offered by two companies FRS and Intershipping, departing on the alternate hour. The fast crossing takes roughly 35 minutes. Moroccan immigration formalities are carried out on board the ferry, to save time on arrival. The ferry companies also provide a free coach service from their offices in Algeciras port to the ferry in Tarifa. This is the recommended ferry route for tourists visiting Tanger or those taking onward train or bus in Morocco. Here is a guide to the journey and procedures. Make a reservation online. Frequent hourly services between Algeciras and Ceuta (Spanish enclave) are available from FRS and Acciona Transmediterrea. The fast ferry boat takes approximately 35 minutes to make the crossing. Make a reservation online. Frequent daily service from Algeciras to Tangier Med (Morocco) is available through two companies, Acciona Transmediterrea and FRS. The service takes approximately 70 minutes on the fast ferry. Tangier Med is the port located 30km from Tangiers town. This is the recommended route if you are driving south in Morocco and do not want to visit Tangiers. Make a reservation online. Once a week departure from Gibraltar to Tangiers Med (Morocco) is available through the ferry company, FRS. The crossing departs Gibraltar on Friday evening and depart Tangier Med on Monday evening. The crossing takes roughly 80 minutes. The service is primarily for Moroccan workers in Gibraltar. Make a reservation online. Service available daily from Malaga to Melilla (Spanish enclave) except Sundays through Acciona Transmediterrea. Service available daily from Motril to Tanger Med through FRS. Crossing takes seven hours. The service is particularly useful for those traveling from Northern Spain and Europe and wiching to reduce their driving distance. Service available daily from Motril to Melilla (Spanish enclave) through FRS. Crossing takes four hours. The service particularly useful for those traveling from Northern Spain and Europe and wishing to reduce their driving distance. Make a reservation online. Service available daily from Motril to Nador (Morocco) through Naviera Armas. Crossing takes four and a half hours. The ferry company provides a free connecting bus service for passengers from Malaga bus station. Service available twice weekly from Motril to Al Hoceima (Morocco) through Naviera Armas. Crossing takes three and a half hours. The ferry company provides a free connecting bus service for passengers from Malaga bus station. Ferries are available daily from Almeria to Melilla (Spanish enclave), through Acciona Transmediterrea. The crossing takes approximately four hours. Ferries are available three times daily from Almeria to Nador (Morocco), through Acciona Transmediterrea. The crossing takes approximately six hours. Ferries are available twice a week from Almeria to Oran (Algeria), through Acciona Transmediterrea. The crossing takes approximately nine hours. Ferries are available three times a week from Almeria to Ghszouet (Algeria), except for Saturdays through Acciona Transmediterrea. The crossing takes approximately nine hours. The service is available through Acciona Transmediterrea, usually once a week to each of the four Canary Island ports. Follow the company link to see timetables and to make your reservations. The service is available through FRS and Naviera Armas, once a week departing mid day on Saturday to Arricife (Lanzarote) arriving mid afternoon Sunday, Las Palmas de Gran Canaria arriving Sunday evening, Santa Cruz de Tenerife, arriving early hours of Monday morning. A more frequent service is offered throughout July and August. Make a reservation online. High-speed Catamaran from Tarifa, Algeciras and Gibraltar to Tangier in Morocco.